Posted on March 12, 2015 by staceyanderton1	in News and tagged Leukemia survivors, SHS. Two students at SHS recently defeated the life-threatening disease of Leukemia: senior Matt Myers and junior Catrina Erie. The national color for leukemia is orange, and students and staff were asked to wear the color Monday, March 9 in appreciation of Matt and Catrina’s recoveries. Orange balloons were given to each teacher and hung in the halls outside of their rooms. Matt came back to school his sophomore year after winning the battle. “They [my emotions] were mixed. I was gone for a year, so I didn’t know what had changed and what hadn’t,” he said. Upon returning to school, he made the adjustments necessary and did well. Matt will proudly be graduating with the class of 2015. He had a smile on his face as he explained how happy he was to graduate. “Hold on, there’s always someone there to back you up,” he said. The school and community are so proud of Matt and his success over the years. 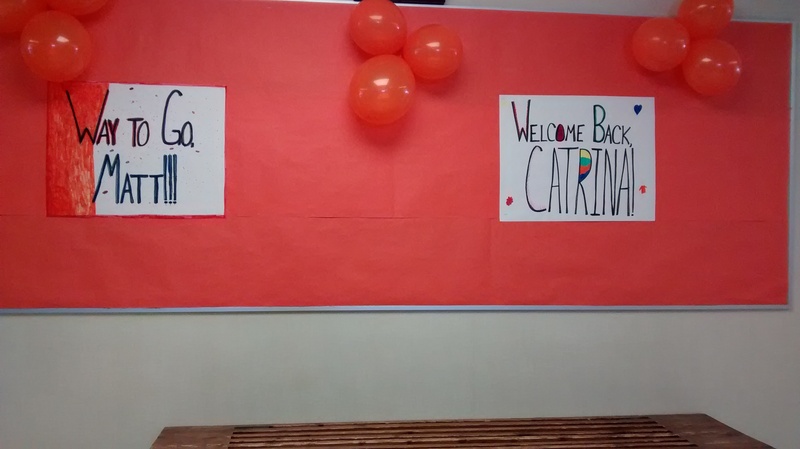 Catrina returned to Saegertown on Monday March 9 and also wore the color orange. For those who do not know, Catrina found out she had Leukemia at the end of her sophomore year, but she fought hard and managed to pull through. “Physically [I’m] okay; mentally [I’m] normal,” she said. With the new changes, Catrina hopes to adjust quickly.